Peirce was founded on, and has historically been led by, visionaries. In 1893, when numerous institutions of higher education embraced a status quo that excluded women's participation in higher education, Peirce leaders opted, instead, for inclusion. They blazed the trail and created an environment that made education accessible, attainable, and relevant for women. 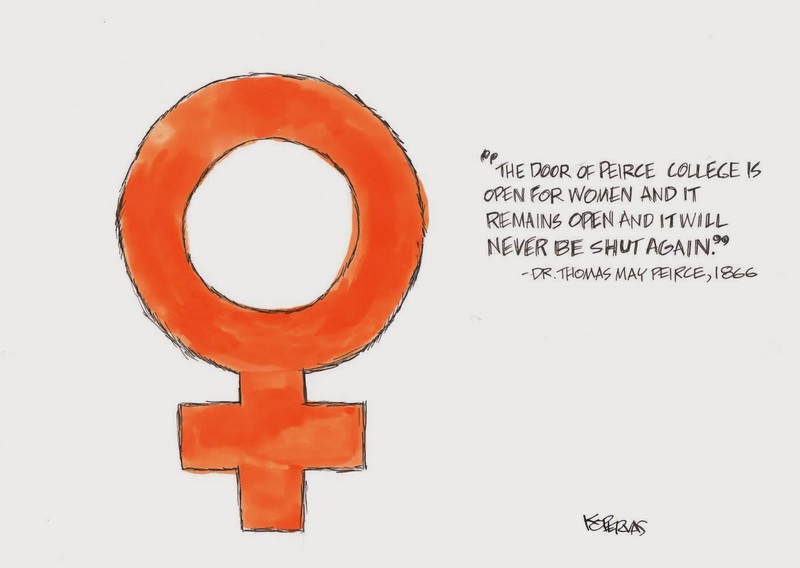 This month’s 150th anniversary cartoon celebrates Peirce’s unwavering focus and commitment to women and the development of their—of our-- leadership. Today, we continue the Peirce tradition of serving women. In fact, well over 70% of our students are women, many of them pursuing an education while also juggling myriad responsibilities including family, work, and community. Since opening our doors to women, we have always ensured they have been supported. Our celebration of women and support of their development and leadership couldn’t be more timely! After all, March is Women’s History Month! It is also the springboard for the implementation of our College’s three-year Strategic Plan. We are currently in the process of implementing our next wave of innovation, expanding our geographic footprint, deepening our relationships with businesses, and providing even more expedient paths to degree completion complemented by customized support services. All that we do will continue to support the women we educate and serve. Going forward, our next 150 years will expand the work we have done in our first 150. Back then, we were not afraid to embrace change. Today, we are even further driven and more proud than ever of our pioneering spirit. It’s simply been a part of the Peirce DNA. It is this makeup that has kept us steadfast in our commitment to educating and empowering women. As the needs of women have evolved, both personally and professionally, we have decided to not just keep pace. Instead, we have resolved to be as proactive as we were when our first leader, Thomas May Peirce, vowed that following the beaten path and accepting the norm wasn’t good enough for Peirce College. We remain committed to his courageous vision and spirit. Women in Leadership Speaker Series: This panel discussion featuring senior leaders from local businesses and industries will be held on March 12th. Here, we will also honor two outstanding Peirce women who have done remarkable work academically and professionally. Women Who Are Leaders in Intimate Partner Violence: This event is a discussion led by our Legal Studies Division. We will be featuring Peirce College Professor and victim advocate, Kate Watson, along with Assistant Professor and Criminal Justice Studies program manager, Bob Brzenchek. The event will also feature other speakers including a representative from Philadelphia Police Department’s Special Victims Unit. The discussion will be held on March 17th, from 5:30-7PM during the Criminal Justice Studies capstone course. In March, we hone in on and celebrate women as students, graduates, employees, and stakeholders. But our commitment isn’t limited by the constraints of a calendar. Just as we did 150 years ago, we will continue our legacy of celebrating, educating and supporting all students with quality and equality year-round. It was our leader’s decision in our initial stages and it remains a constant we are most proud of today.